The core of our technology is the UME (Unit of Minimum light Emission) composed of two high quality LED with selected bin and colour temperatures monitorized and regulated by a CPU processor with out own software. Why not just use a single Fresnel lens as do the traditional manufacturers? One of the leading innovations THELIGHT brings to the industry is the compactness of the fixture combined with extremely high output and the possibility to vary the colour temperature. The use of a single fresnel lens would obligate the manufacture of the traditional bulky Fresnel projector. Why use a base of three different coloured LED on the High-power products? We do not use LED of different colours. Rather we use LED of different colour temperatures (warm white and white) as well as a special colour LED, all of which are meticulously selected. The Control Unit uses software capable of monitoring each LED in addition to regulating with great precision the level of luminance of each one so that the total mix of light emitted results in perfect white light with an elevated CRI for each colour temperature. Colour temperature is not the only consideration when using light fixtures in cinematographic applications. It is also necessary that there are no gaps in the spectrum. The warm white and white LED we use allow a wide range of colour temperatures covering the entire spectrum of visible light as well as a high CRI. 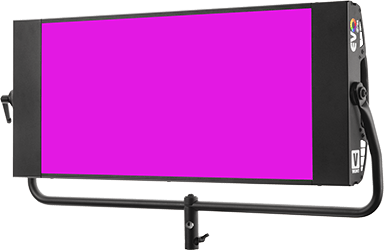 The addition of the colour LED with a carefully selected BIN fills any gaps in the spectrum and elevates the CRI value across the range, while the specially designed software enables maintaining the green/magenta correction within the standard chromaticity scale. Why not use three RGB LED like other manufacturers? By mixing different proportions of light emitted from each LED, the RGB technology can produce practically any colour. This is adequate for spectacular illumination. 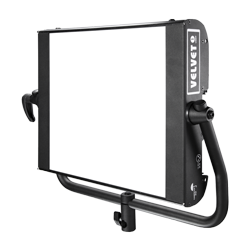 However it presents two problems for professionals filming for HD, film or photo: it is impossible to achieve quality white light with the necessary CRI and even with the addition of coloured LED, light output is not sufficient. This is because RGB LED construction does not allow achieving neither energy efficiency nor high output levels. What are the advantages to THELIGHT technology? 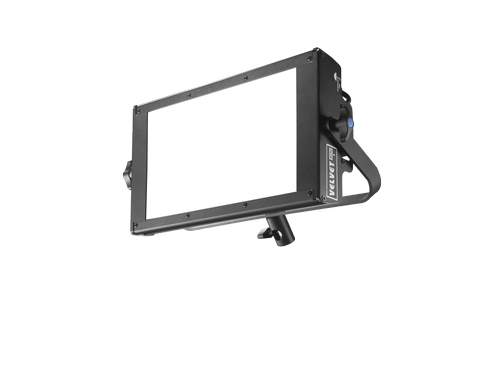 THELIGHT technology allows remote control of colour temperature, intensity variation (without affecting light colour) and on the High-power line also green/magenta adjustments to deliver bright, instantaneous lighting with very high output. All this is achieved with low power draw, long operating life in a slender and lightweight casing. 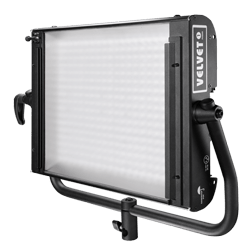 These fixtures are extremely versatile because of their compactness and the possibility to digitally adjust the light, making the use of colour filters unnecessary. Is it possible to shoot with any combination of camera speed and shutter angle? Our CPU operate the LED at a 16 KHz frequency and had been designed to avoid any flicker problems between the lights and the cameras. They are compatible in countries with 50Hz as well as 60Hz. As with any electronic device, failure of certain internal components may result in flicker on a high-speed shot. For this reason it is recommended to run a camera test on such critical speeds. Can I connect my High-power fixture to any Control Unit? Our VAC and AC-DC Control Unit has been designed to supply power and guarantee consistent colour quality with any THELIGHT lamp head. There is no problem if you accidentally mix VAC Control Units and light fixtures: the light emitted will always be correct. But caution! the VDC Control Unit has been designed to battery power only to the 4LIGHT lamp head. How does the DIMMER work? Will it affect the colour of the light? The dimmer of our Control Units is totally digital and guarantees the regulation of light intensity with minimal changes in the selected colour temperature. It is easy to control – just select the desired colour temperature and push the + or – buttons of the dimmer to change the intensity. It is calibrated in increments of 1/2 stops. Holding the button down the variation will be continuous. How is the colour temperature varied? By use of +/- buttons measured in increments of 100K to increase or reduce the colour temperature. Above them is a digital display which indicates at all times the selected temperature. The value 3.2 corresponds to 3200K and the value 3.3 to 3300K and so on. Is the displayed COLOUR TEMPERATURE indicator reliable? The reliability of our digital device is guaranteed by the calibration previously made in the laboratory using a spectrometer. In the case of marked differences in measures made by the user, these should be attributed to imprecision or faulty maintenance of the manual photometers or colour meters. How does the +/- GREEN switch work? THELIGHT guarantees the correct colorimetry for light emitted by their fixtures, calibrated in the laboratory according to current international standards of the CIE 13.3-1995 for the average CRI and the chromatic co-ordinates (x, y CIE-1931). This certifies that our luminaries have no green/magenta deviation. The +/- GREEN switch allows, however, to alter the colour of the light emitted at any colour temperature towards green or magenta in increments of -/+ 1/8 and ¼. When this switch is not in the standard position a green LED light turns on in the Control Unit to warn that the light emitted no longer guarantees the correct chromaticity. What happens if there is a power failure or the power supply to the Control Unit is accidentally disconnected? Nothing at all. Both the high-power LED panels and the Control Units are protected against failures in the connection or power supply. In the most extreme case, it may be necessary to replace the fuses next to the power source plug at the back part of the Control Unit. In addition, the software is designed to store in the memory the last adjustments recorded so that when power is restored the lighting will resume the same values.